So our ice still is predicted. I am hoping it turns out to be not so bad as a lot of their predictions do. 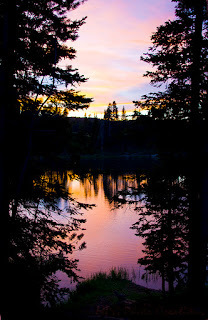 I am just thinking warm thought of summer days like this one several years ago on a trip to Yellowstone National Park. We had just arrived at the park and set up our trailer and decided to go for a walk down to Fishing Bridge which was what our campground was named for. This was the sunset I was able to view and a great way to spend the first few hours in the park. This image was difficult to get with it looking nice as there were so many insects, most likely mosquitoes, swarming about. I got lucky with this shot.